Wooha! Time to empty my cabinet. I got this mini from Roman about half a year ago - and had fun painting it. Its a 54mm figure from the Inquisitor-range of Games Workshop - and as far as I know, big Kong gave me something special, as I believe this version isn't available any more. I made the wall out of a baked slice of fimo and finished it with the Dremel and more fimo. Then some milliput and plastic putty for the plaster. The window is a cheap trinket, an earring or something like that. It was an ape who whispered this idea into my ear. I broke it to make it look like it was burst by an explosion. The wall itself is fixed on the base with some pins of steel-wire. 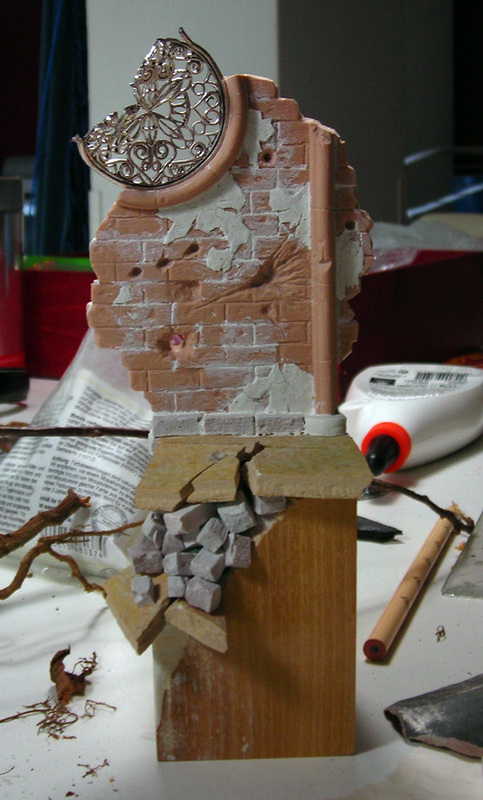 The concrete, the Eldar is standing on, is a broken wall tile. I also used bricks out of gypsum for the groundwork. The positioning of the arms and the rifle was extremely difficult. A lot of putty was needed to fill the gaps between shoulders and the arms. The mini is fixed to the base with a steel wire - 1,5mm diameter. A smaller one would have done it also, but .... I didn't have one by the hand. Drilled his shoe, killed his shoe, resculped his shoe - now it should be earthquake-resistant. The rest was pure joy of painting. If interested, simply click on the banner above or click here. Found an image of the unpainted base. Almost exactly 6 months ago, in fact - I just noticed that this mini is CMoN's "Blast from the past!" for today. Is that a coincidence, or did you plan it that way? Not a plan. Maybe fortune.